Soothing men’s shampoo for irritated and itchy scalps. Soothing irritated skin on hands, face and body is one thing, but it can be difficult to soothe the scalp. Some shampoos mask the problem of a dry, itchy scalp and don’t really treat the problem. 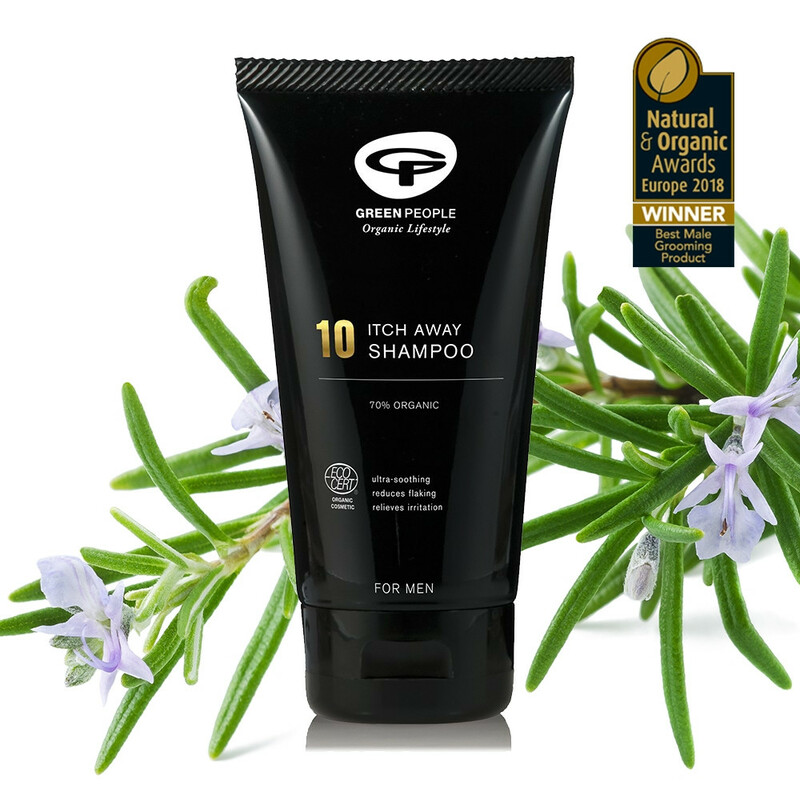 Organic No.10 Itch Away Shampoo by Green People will relieve irritation and help soothe your skin naturally, whilst providing gentle but effective cleansing for your hair. Natural ingredients include Organic soothing Aloe Vera, calming Yucca, Pineapple to exfoliate and refresh, Rosemary to protect and soothe, Cypress and antibacterial Tea Tree. Hair Type: Suitable for dry, itchy or flaky scalp, and those suffering with psoriasis. Application: Apply sparingly to wet hair and gently massage through the hair to the ends, leave for one minute. Rinse thoroughly. Repeat if required. Ingredients: AQUA (SPRING WATER), SODIUM COCO-SULFATE (FROM COCONUT), COCAMIDOPROPYL BETAINE (DERIVED FROM COCONUT), DECYL GLUCOSIDE (DERIVED FROM CORN), ANANAS SATIVUS (PINEAPPLE) FRUIT EXTRACT, ALOE BARBADENSIS (ALOE VERA) LEAF JUICE POWDER*, ALTHAEA OFFICINALIS (MARSHMALLOW) ROOT EXTRACT*, CHAMOMILLA RECUTITA (CHAMOMILE) FLOWER EXTRACT*, AROMA [ROSMARINUS OFFICINALIS (ROSEMARY) LEAF OIL*^, CUPRESSUS SEMPERVIRENS (CYPRESS) OIL*, MELALEUCA ALTERNIFOLIA (TEA TREE) LEAF OIL*, LAVANDULA ANGUSTIFOLIA (LAVENDER) HERB OIL*^], YUCCA SCHIDIGERA (YUCCA) STEM EXTRACT, HYDROLYSED QUINOA, BENZYL ALCOHOL, SALICYLIC ACID, SORBIC ACID, GLYCERIN, CITRIC ACID, LIMONENE, LINALOOL. *INGREDIENTS FROM ORGANIC FARMING. ^FAIRLY TRADED (Period After Opening 12M). ECOCERT 98.9% NATURAL INGREDIENTS; 70.8% ORGANIC INGREDIENTS. Ingredients that Green People don't use in their products: Naturally No - SLS, SLES, methylisothiazolinone (MI), methylchloroisothiazolinone (MCI), parabens, lanolin, phthalates, propylene glycol, alcohol (ethyl alcohol, ethanol), harsh foaming agents, irritating emulsifiers, synthetic fragrance, PABA-sunscreen, gluten, colourants, petrochemicals, urea, DEA, TEA or PEGs.